I would like to begin this post with an apology for my long absence. A lot has transpired over the past two weeks – thankfully for better reasons than worse. From a family wedding to a recent engagement of a friend, 4th of July and a family reunion plus more. I haven’t had much time for blogging. Despite the political and regional tensions where I live, nothing can stop me from delighting yourselves with my recipes. I thank you for your support and patience. I hope this healthy smoothie recipe I am about to share with you was worth the wait. I promise that more recipes will follow shortly. Fresh cherries and mango happen to be at their peak this season. I stocked up on a bunch of fresh cherries and mango. I normally prefer to munch on cherries as they are but occasionally explore other creative options that I can use with them. I had many ideas in terms of treats that I can make using these fruits but I was stalling for too long and they were beginning to rot. 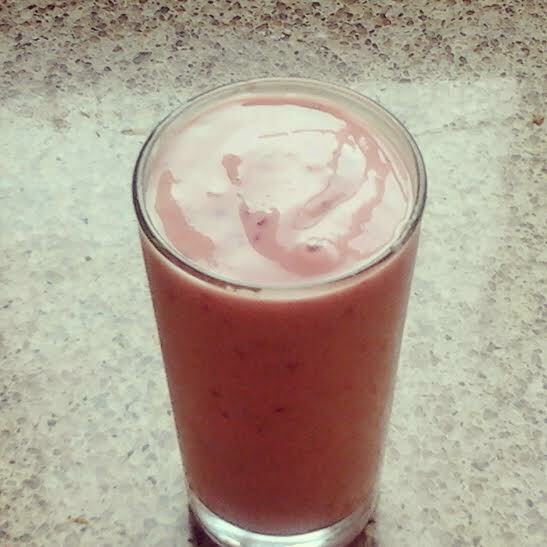 It’s hard for me to dispose of fresh fruit, so smoothies were a simple, quick yet delicious solution to my dilemna. What other healthy and exotic way to cool an overheated palate other than learning how to make smoothies using cherries and fruit? I could never tire of smoothies; the combination of possibilities never end. I never incorporated cherries into my smoothies before but didn’t think of it as a risk factor. Adding cherries introduces a sweet yet tangy flavor this red mango smoothie. The mango merely heightens the taste of this smoothie. Place all ingredients in a blender and blend till smooth. Add more water or milk if the smoothie is too thick for your liking. Use leftovers for popsicles if you like. This entry was posted in Breakfast, Drinks, Gluten Free, Sugar-free, Vegetarian and tagged fresh cherries and mango, healthy smoothie recipe, how to make smoothies, red mango smoothie.